Red Bull KTM Factory rider Jeffrey Herlings has put together a brilliant season, and as close as perfect as you could get. Picking up his 84th GP last weekend, the Dutchman moves a step closer to Stefan Everts 101 GP wins. Always looking to impress, he now heads to Redbud in America to take on the Americans based riders, and believe me, those guys had better be ready. This kid wants scalps, and he won’t slow down his preparation for a second to show the World just how good he is. The four time World Champion talked to the press and MXlarge was there to take it all in. Well done Jeffrey, great weekend for you? It was a great weekend. To become world champion is one thing, but this weekend I was dominant again, got the holeshot but had a tip over (in the second moto). Number 84 on the wish list, done. I can’t wait for the Motocross of Nations for my country and also individually. Thanks to KTM they work so hard for me. 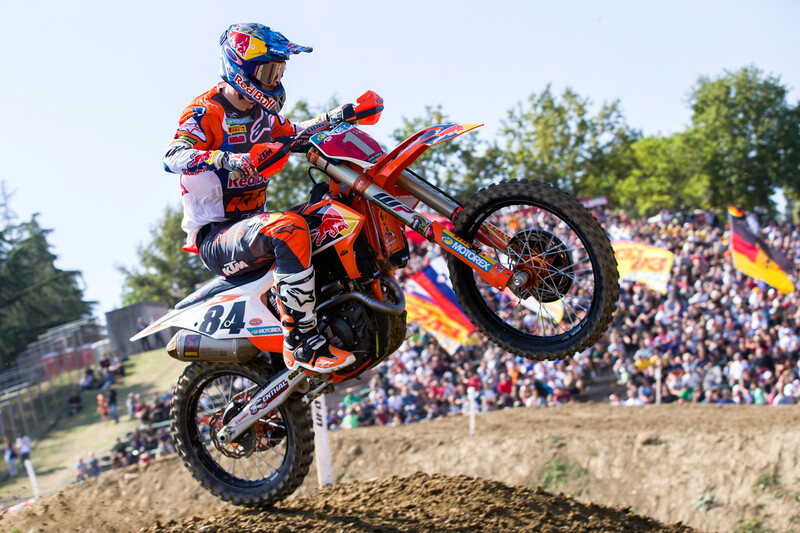 Has it sunk in that you are World MXGP champion? It has sunk in, but it is hard, because we are still in full training and there are so many obligations with media and interviews and it is hard to enjoy the moment for now, but last weekend and next weekend in Motocross of Nations, then I have a small race in Holland the week after that, then I it will be quiet for a few weeks and charge the batteries. Can you talk about what it is like after our championship win? You know, everyone is waiting for the Herlings vs Tomac fight, so it isn’t like I can slow down. I have won the World championship, but to beat Tomac is on the wish list and as a country it will be difficult, but I will do my best. I feel like the last thing I want to accomplish. After Assen I took one day off, and I want to try and win at Redbud. That is my goal. I didn’t have time to party, but I will all winter relax and enjoy myself. It has been an amazing season for you? It is a great way to finish of the year, to finish off with a win, so I am happy and thankful for that. Its been a great experience and a great year. I have met a lot of great people and I want to thank my team, because without them I wouldn’t be in this position to accomplish what I did. If you look at the statistics this year, we missed one round, raced 19 rounds, won 17, my worse moto result was a third, worse overall was a second, I won the world championship, I won the Dutch championship, if you look at that, its pretty unbelievable. It is something that will be hard to accomplish again. Coming into this weekend, maybe you didn’t have a whole lot of time to prepare, but you got the holeshot in the qualification race and pulled away to win it. It was a good day. I mean to win the championship, but I didn’t’ want to just ride around (in Imola). The goal on Sunday was to get the same result as the Saturday and the track is very small, and tight, and the sun was a problem. I wanted to try and stay out of trouble. I got the holeshot and led all the qualification race laps. What about the start, because you have pole, but is it that much of an advantage? I hope they go like MotoGP or F1, where you get an advantage, they should make it that you have a bigger advantage from the inside. What goals do you have now? You know, the most beautiful way to finish off the season is to go 1-1 at the Nations. If I can accomplish that, that will be the cherry on the cake. It would be great and I am super motivated to race those guys, Tomac, Roczen, Barcia, Plessinger, racing the main guys. Racing the Americans on their home turf, they are fast and it isn’t going to be easy, but we will see. How do you like the tracks this year? The tracks are much better for MXGP than for MX2, because it is the Formula One of motocross. They water the track a lot before MX2, which gives us a primed track. I think with 20 rounds; some tracks don’t allow to give a great track. All the conditions we have had, some tracks don’t allow to give you a great, great track. For example Arco is a great track, a natural track, but it is small, same as this one (in Imola), they did the maximum they can get and did a really good job and when you have 20 race tracks, you can’t always have 20 beautiful, awesome wide tracks. It is the Motocross World championship and we have many different dirt’s, like sand, clay, dirt, mud, you name it. I think they are doing a good job and also having a ride like Rui (Goncalves), as he was a top guy as a rider. From event to event, you have many different guys working on the track, so it is still hard for them to do the best possible job. Different people working on the track in Indonesia than in Assen, but hopefully we can keep improving.